CAMBRIDGE - At first, some people wondered what Bernie Rudolph was doing out there early in the morning, raising the flag in Fort Washington Park and lowering it again at dusk. 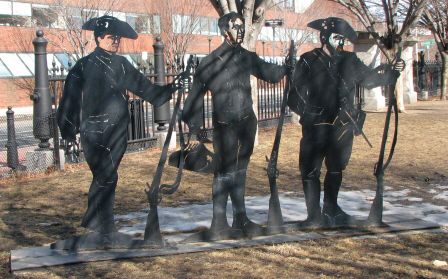 He always had his young son, Stuart, with him in those days, fair weather and foul, standing at attention or doing the honors at the Revolutionary War-era fort at Waverly Street and Putnam Avenue. No one joked about it, though. There was just general awe at their dedication. The father and son did this for four or five years, with flags that had flown over the nation's Capitol, procured for them by Tip O'Neill, the late speaker of the House who represented this neighborhood, until, Bernie got the city and the utility company to put lighting in so the flag could be displayed around the clock. "Fort Washington is a symbol and a vision, a reminder of what we are, where we came from, and what we can do," Rudolph says of the fort constructed on orders of George Washington to protect the mouth of the Charles River against the British. Recently, the city of Cambridge and many of the adults who had learned a civics lesson from Bernie as children turned out to show their appreciation to him, not only for his and Stuart’s flag duty, but for Bernie, might have become a parking lot. 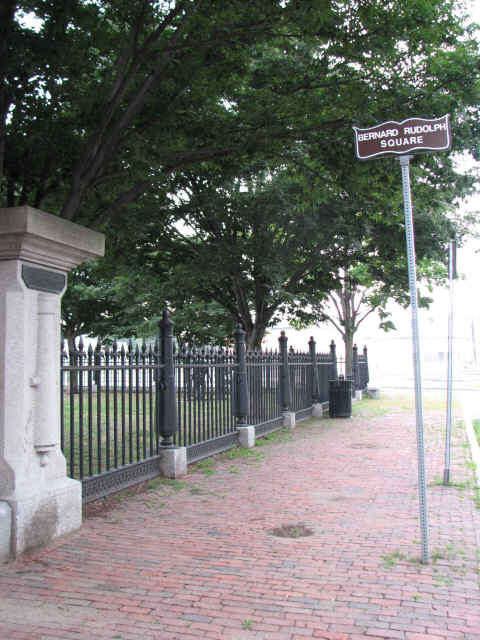 In reorganization of his efforts, the Cambridge City Council has named the Fort Washington Area Bernard Rudolph Square. Eight-Seven tomorrow, and afflicted with infirmities of old age, Rudolph sat in a wheelchair during the ceremonies and was obviously moved. He is a Pudgy, grandfatherly man with a thatch of gray hair and a quick sense of humor. For almost 70 years he lived in Cambridgeport, before moving to Winchester four years ago to live with his son. Stuart, and Stuart's wife, Janet. Those at the ceremony said it was typically Bernie to mention all the people who helped him his effort to save Fort Washington Park, including his "pro bono attorney Eddy Applestein," Cambridge Post 35 Jewish War Veterans, and the I late Pasquale Reale, director of veterans' services for Cambridge, and his four grandchildren and daughter-in-law. Mostly, though, Bernie said in an interview last week, it was his wife, Marion K. Rudolph, now in a nursing home, who was "my chief aide, my greatest critic and my biggest supporter." Together, through the years, they organized raffles and other events to raise money for a flagpole at the park and to make sure others loved it as they did. He still has the 1968 canceled checks: $586 for the pole, $489 for installation. Before the '60s, before Bernie launched his campaign to save the park around 1967, the fact that it was generally ignored bothered him. "During the Depression," he said, '"people ripped sections off the fence to sell to junkyards. Through the years, it suffered from a bad case of neglect. Eventually, he convinced city officials he was right. He still harbors a grudge against a neighboring trucking company, long since gone from the site that tried to get the park for a parking area. When the company or anyone else appeared to make transgressions against the park or plowed snow against the fence, Bernie was there with his Polaroid. He got the community involved in the fort. Tip O'Neill got the flags. Schoolchildren visited it and wrote essays about it; they still play ball there. Veterans groups held commemorations there and a Flag Day observance. "I've loved this country since the day I came here," he said. "To me, the fort is a reminder of what we are, where we came from and what we can do." For Rudolph, the journey from immigrant lad to American Patriot began more than 80 years ago when his family fled on foot from Russia to Poland to escape pogroms against Jews. "There was no law and order in Russia at the time" Rudolph said, "and they were just killing Jewish people. Once, bandits broke into our house and lined us up against the wall. They were going to shoot us and I started to cry, begging them not to kill my mother. Then, more bandits burst in and let us go." Hyman Rudolph, Bernie's father, had already gotten out of Russia and had come to Cambridge, where he worked, first as a house painter, waiting for the day his family could join him. "But World War I broke out," Bernie said, and we were trapped in Russia." He still recalls being carried in the arms of his, Mother, Rose, when they walked with members of the family across the border to Poland. They slept during the day and walked at night to escape detection. "I remember my mother put her thumb in my mouth so I wouldn't cry," he said. Bernie's two older sisters had died in Russia. Once the family got to Poland, Bernie said, they had to wait three or four years before being eligible to enter the United States. "Before my father left Russia," Bernie said, "people used to tell him, 'Go to America, Hymie, There's gold in the streets,' So my father wanted to see the gold, and this country never disappointed him." In 1921, Bernie and his family were reunited with Hymie in a section of Cambridgeport, then known by the locals as "Greasy Village," when Bernie was about 10. The name derived, Bernie said, “from the aroma of fat-rendering then in the area. On a hot day, he said, when the smell mixed with that coming from chocolate factory, the mixture boggled the senses. When the lead inhaled from his painting jobs began to affect Hymie Rudolph’s lungs, Bernie said his father opened a little luncheonette on Allston Street, not far from Fort Washington Park. He moved his family into quarters upstairs. Soon, Hymie’s by the Charles became a neighborhood landmark. Charles L. Gittens, deputy director of the office of special investigations in the criminal division of the US Department of Justice, came from Washington to the square's dedication to read an essay he had written in 1953 about Bernie’s father. Gittens used to live in the neighborhood and, in a telephone interview, remembered playing ball in Fort Washington Park as a boy, the diversity of the neighborhood and, in particular, Hymie Rudolph. At the time, Hymie's luncheonette was also a grocery store. "In addition to having readily available everything from a common pin to a 10-pound ham and being a haven for the younger group on Saturday night, ", Gittens wrote in 1953, "the main attraction, of the spa is its pudgy, spectacled proprietor. Hymie's logic and down-to-earth advice are almost proverbial in the Village." Bernie, meanwhile, helped out at the store while going to school, and after graduating from high school, went to Boston University at night to study accounting. "Then," he said, "I went to airplane school so I could be a mechanic US Air Force during, " World War II". He served from 1941 to about, 1946, working on planes and inspecting them. "When I got out of the service", I couldn’t get a job, so I went to work in the store with my father. Fifty-Two years ago, Bernie and Marion were married. Stuart Rudolph, 43, picked up the story where his father left off. “After the war”, he said, “the neighborhood changed and some businesses moved out and Hymie’s by the Charles luncheonette disappeared, but the store part of it remained. Bernie ran it and started working nights at Polaroid. But, because he had a wife, his parents, and three kids, (Sandra, Lois and Myself) to support, he eventually closed the store and started working full-time in research at Polaroid”. Bernie has been retired for long time now. He misses his beloved Marion and daily walks by Fort Washington Park. But he is buoyed by the thought that because of what he did, the flag will always fly there. Fort Washington, a Cambridge cannon battery ordered built by General Washington in 1775 to protect the southern flank of the Continental Army against British attack, has been under siege from other enemies in recent years. If it weren't for the efforts of a Polaroid employee, Senior Materials Specialist Bernard Rudolph (O), the fort would have succumbed to vandals long ago, and would probably have been paved over and made into a parking lot. "I love that old fort," said Mr. Rudolph, who has lived only a couple of blocks away from it since 1930. "It's a shame to think of what it used to be like, and what the city has let it become." 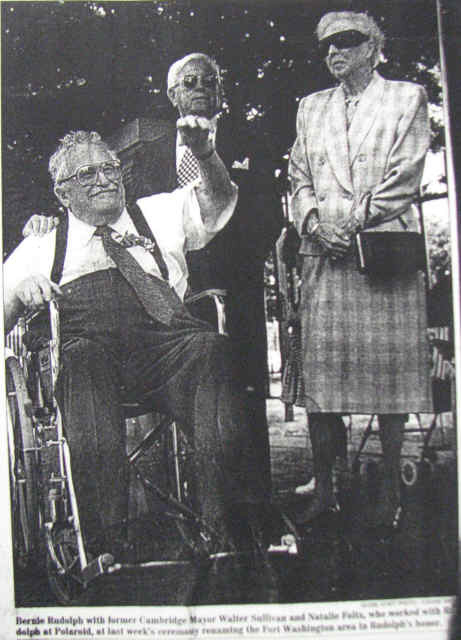 Over the years, Mr. Rudolph, President of the Cambridge Jewish War Veterans, has been the fort's only protector. 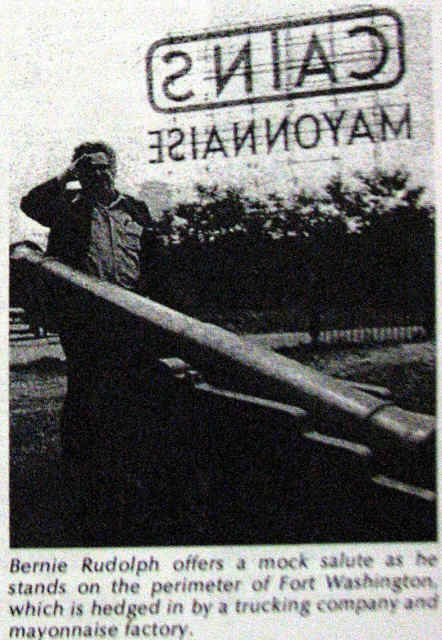 In 1968, he organized a raffle to erect a permanent flagpole. "My son and I raised and lowered the flag every day, until we talked the Electric Company into installing lights so the colors could fly 24 hours a day." He places a wreath there every Memorial Day and keeps a watchful eye on the battering the fort receives from trucks and vandals.